Users of the app can contribute to the community by posting detailed product reviews or product-based lifestyle and fashion tips using photos, video, and text. 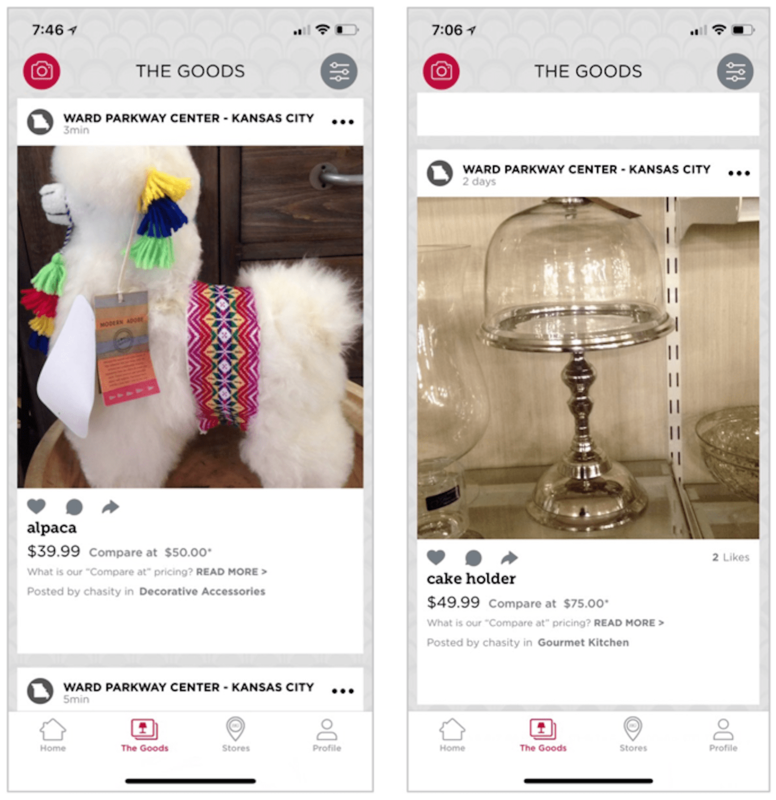 Posts about a particular item often contain tags with information about price, brand, and the location of purchase (even down to the exact store). Product posts are integrated with Redbook’s shopping platform, allowing browsers to navigate from a community post to purchase the product being discussed. Redbook now has 17 million female users, and the number is still growing as we speak. So, what makes it so popular? Access to overseas products at lower prices. China is one of the world’s largest consumers of luxury goods. Many overseas and cross border products are brought into China with high customs fees. Redbook targets this opportunity by sourcing products from overseas sellers, storing them in free-trade zones that are not subject to the customs fees, and redistributing them to its Chinese consumers. The platform functions as a mediator, providing Redbook shoppers access to various overseas products at relatively low prices. Though access to foreign products at lower prices is an important benefit for Redbook’s users, in this article, we focus on the first two reasons listed by our study participants and on why they foster customer loyalty. As participants commented on the thoughtfulness and comprehensiveness of the content on Redbook, we probed further to understand what appealed to them the most. Two main factors make Redbook’s content resonate with users: a sense of community and trust in the validity of the content and of the products. Shopping is a social activity. Over the years, in our Ecommerce User Experience report series, we’ve documented the social aspects of shopping and how they impact online purchases. Online shoppers talk to friends and family about prospective purchases and look for advice and opinions before buying a product. Online product reviews are an important aspect of shopping: shoppers value robust reviews that include details about the reviewers and photos of products in use. 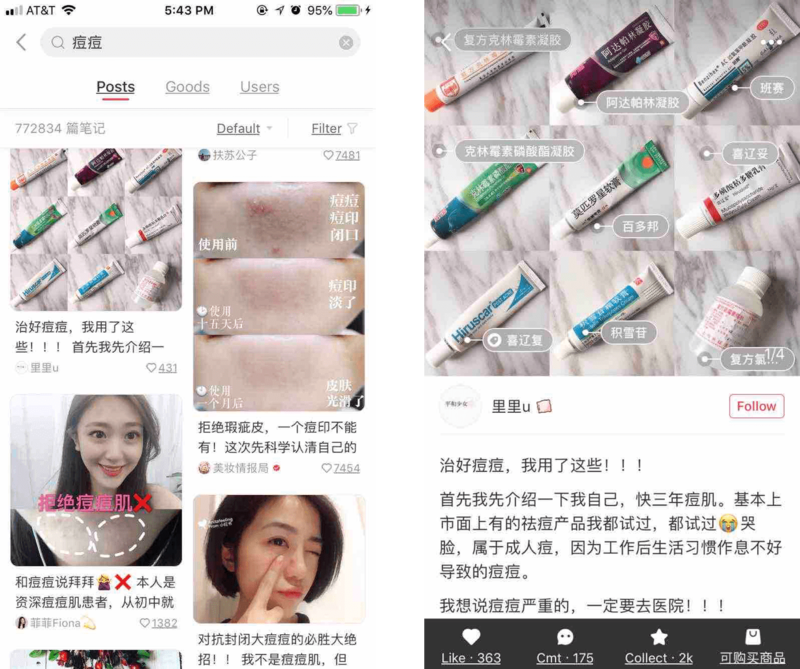 Redbook: A search for acne under Posts (left) returns 772,834 results that users can discover and interact with. For example, one post (right) discusses in great detail how one blogger struggled to treat her acne, what products she used, and how each of them worked for her. On Redbook, people interact and give each other advice by posting, commenting with questions, and sharing experiences. Redbook gamifies the experience by using a hierarchical status system to encourage participation in the app and strengthen the community. 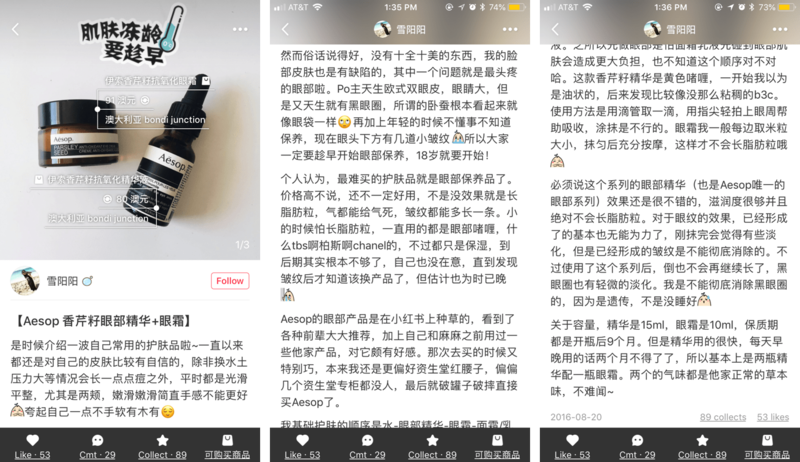 Users start out as a ‘baby’ and, after reaching community-related milestones (e.g., 300 posts with more than 50 likes) they are able unlock higher levels, ultimately reaching the top level, called the ‘golden crown’. By unlocking higher levels of status, users gain access to exclusive features such as customized stickers or watermarks to post on images or videos. Because images and videos are the most eye-catching elements of a post, these extra features mean more opportunities for popularity and exposure. The most-popular influencers of the community may receive sponsorships from brands in exchange for posts about products. Redbook’s community component has helped the platform build a large group of active users and quickly scale up as a sharing and shopping destination. Counterfeit products are a huge concern in China. Fakes are abundant on the market, and luxury beauty and fashion products often become counterfeiting targets. Therefore, Chinese shoppers are extremely wary about product authenticity. 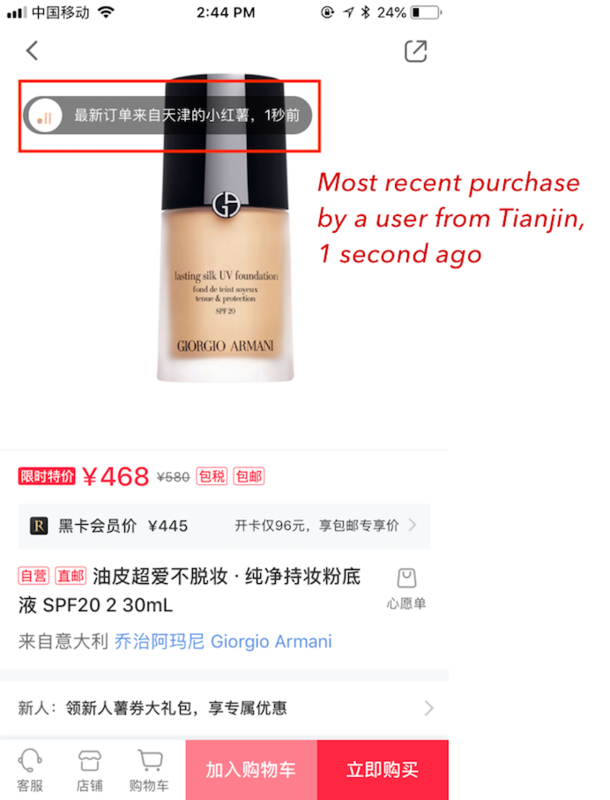 On the product-detail page, the real-time floating information bar indicated that other buyers’ have recently purchased the product. For these reasons, users trust the company to deliver genuine products, and this trust helps Redbook to differentiate itself from competing platforms. “I never have doubts about the products I bought on the Redbook, because I think it brings in the real stuff. But I usually verify the products I bought on other platforms,” said one study participant. A product search on Redbook for Giorgio Armani Lipstick 501 (left) shows only one product listing. 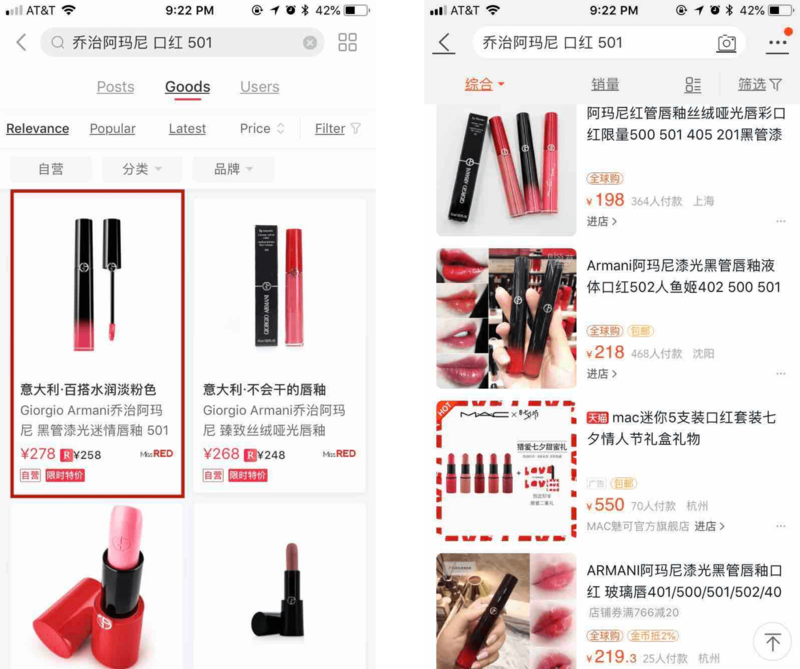 Searching for the same keywords on other popular shopping platforms like Taobao (right) yields thousands of options to choose from, because shops and individual sellers can list their own products, and there are millions of shops on Taobao. It’s up to the user to decide which are real and which are counterfeit. In addition to trustworthy products, comprehensive and legitimate user reviews also help the platform to build trust within its shopping community. Posts on Redbook are typically very detailed and very personal, filled with descriptions, pictures, and videos. Users are motivated to post high-quality content because such content will get attention and comments, will be liked or saved by others, and will raise the users’ community-status level, helping them become popular influencers. In turn, the platform benefits from such content because detailed reviews with a lot of interaction around them appear genuine and legitimate to shoppers. This mutually beneficial relationship between the users and the platform creates a shopping ecology and sustains Redbook’s growth and success. Redbook encourages high-quality content by requiring users to include at minimum one video or one image in their post. In addition, it provides helpful tips for creating new content and for preparing and editing media. Concerns about counterfeits and false reviews are also growing in the United States. In our recent research for the Ecommerce User Experience report series, people questioned the ratings and the reviews they saw online and complained about how difficult it was to recognize authentic reviews if they consisted of just a few words. Redbook: A detailed user review of the Aesop eye cream described the poster’s personal experience using the product. Pictures showed product tags, price and even the exact location where the product was purchased. 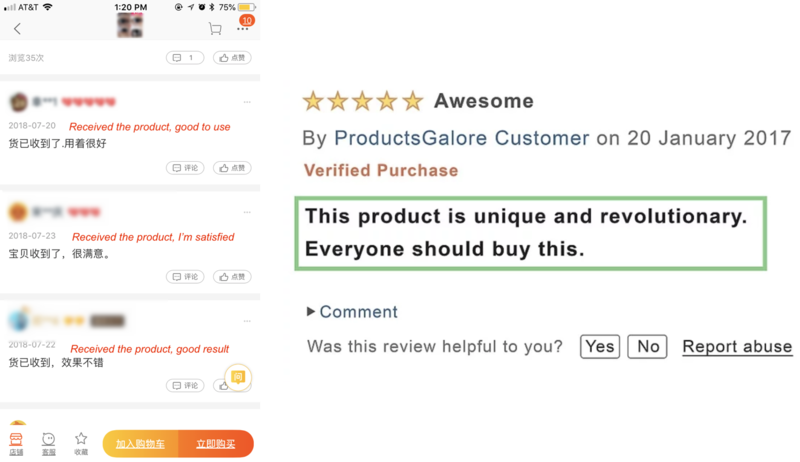 In contrast, there are many suspicious fake reviews on Taobao (left) and Amazon (right). The second factor that influenced users’ perceptions about the utility and value of Redbook was that they could purchase products directly from other users’ posts. Redbook users can not only discover new products from user-generated posts, but they can easily purchase the product being discussed. The integration between community reviews and transactions facilitates impulse buying and saves user effort: users don’t have to remember products they found on Redbook and then shop for them elsewhere, as it is often the case with traditional workflows, where product research and purchasing takes place in different places. Providing product-discovery forums: Encourage sharing and conversations around your products to help buyers learn from peers. This resource can supplement polished product details and marketing messages that consumers can become numb to. Building sharing mechanisms into product pages: The social side of shopping often revolves around asking others for insights and opinions. Social components can fit naturally on existing product pages to facilitate communication between browsers and those who’ve purchased the item before. 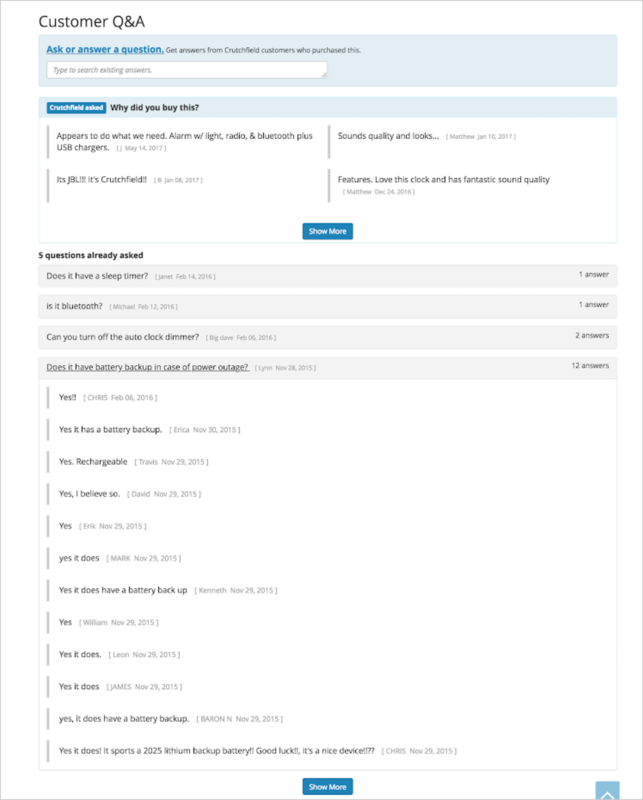 Crutchfield.com included a product Q&A component on product detail pages. This allowed browsers to ask questions and get answers from other buyers. 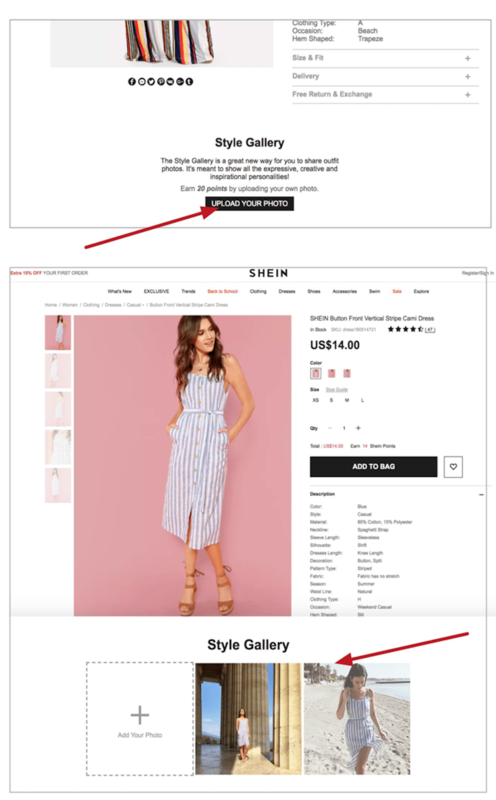 Shein.com encourages buyers to upload photos of themselves showing off their purchases. Shoppers earn points for their participation and browsers get inspiration and details about how the items work for real people. Adding features for encouraging participation: Participation is key to the social element of a business platform. Providing incentives for posting content or gamifying the experience can motivate users and ultimately lead to a strong, active community. For example, the clothing- and accessory-resale app, Poshmark, allows members to earn Posh Ambassador status. Ambassadors receive exposure in the community (which can help them sell their goods). 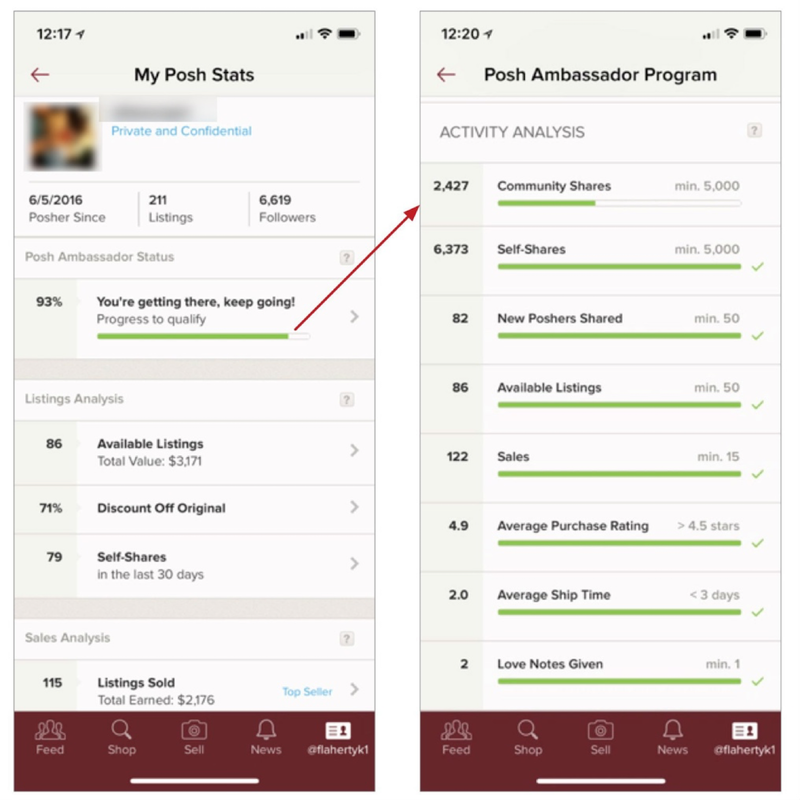 The app provides a page called Posh Stats which indicates how close they are to receiving the Posh Ambassador title based on 9 participation factors. Poshmark users can become Posh Ambassadors based on community-participation factors. Explore connections between third-party communities and ecommerce. Even if you don’t have a lively and engaged community on your ecommerce site, you may be able to create a link between existing communities and your business. Leverage existing social channels and such as Facebook, Instagram, Twitter, or Pinterest and encourage website visitors to explore key pages and hashtags for inspiration. Third-party tools also attempt to bridge that gap. 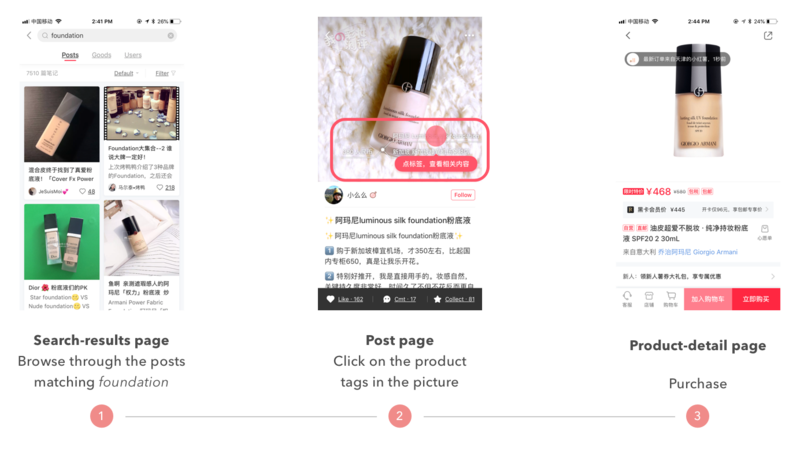 For example, LIKEtoKNOW.it functions as a shopping extension on Instagram to tie product discovery on the platform to product purchase. Content creators can use LIKEtoKNOW.it to tag and link products in their Instagram posts. Likers of the posts receive an email including details and links to these products. Content creators can use LIKEtoKNOW.it to tag and link to products in their Instagram posts. Likers receive an email including details and links to these products online. The benefit for creators is a small commission on any sales made from their posted photo. 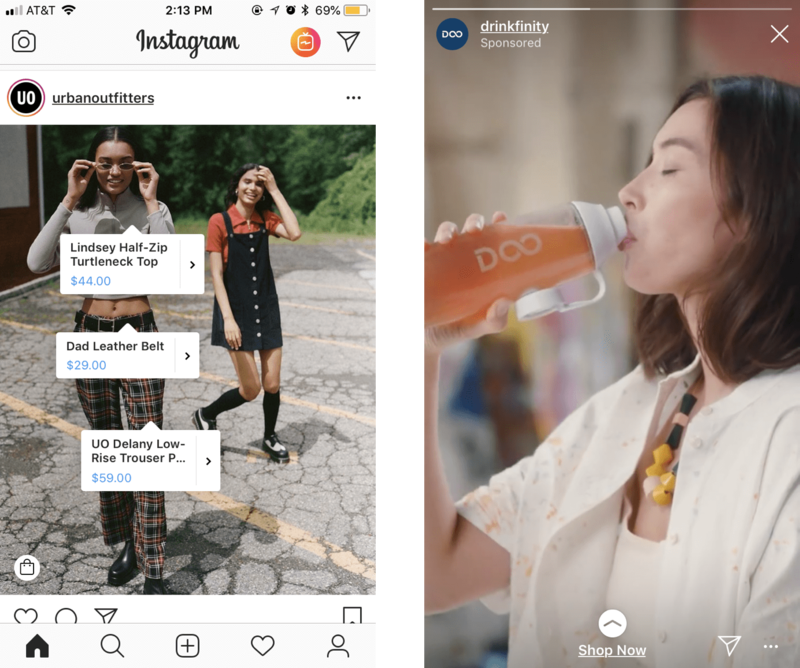 Retailers can also take advantage of their social-network pages to post product details and link to product pages; they should also strive to encourage users to add their own content. 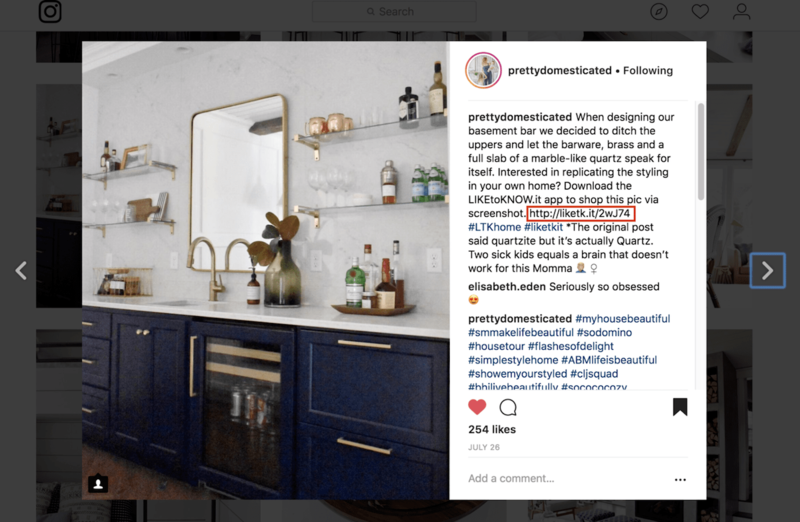 Retailers on Instagram can tag pictures with product details (left) or provide links to product pages (right). Gather insights around customers’ thoughts and experience. Companies can learn a lot by paying attention to what resonates with online shoppers. Establishing and monitoring a community around your products gives retailers the ability to analyze trends and preferences. Consumer insights and real-time feedback can inform businesses of what works and what doesn’t work, enabling them to react and adjust their strategy accordingly. For example, Redbook adjusts product inventory based on how many users like or view particular posts, and discerns which brands to invest in based on these indicators. The success of China’s Redbook illustrates the power of community and trustworthiness in ecommerce. Redbook encourages participation in its ecommerce community in order to build quality, trustworthy content. By combining this strong community with other tactics that establish its products’ credibility, Redbooks drives engagement and trust around purchases made on the platform. Previous articleWhy are creative people perceived as different from everyone else?